Of all the titles I have given to my blog posts over the past months; including words such as “mountains”, “flamenco” and “earthquakes” I am not sure I have ever put three words together to make such a divine phrase. The first two may sound at first like things that are in abundance and easy to enjoy – which they are – but sometimes I come upon places that do them so perfectly that they must be written about. See my post last week on The Parlour Tearoom for more on tea. Devizes, Wiltshire is home to a wonderful smorgasbord of pubs, cafés and interesting shops; the first to be discussed here is The Vaults, a beer shop and alehouse with an array of cask ales and bottled beers from some of the best breweries around the world. Definitely one of my favourite micro pubs, with its friendly staff (who can advise you on what beer may be the best for your tastes and will even allow you to swap it after purchase) and brilliant underground vaults seating area. They are constantly expanding their selection of beers which currently have flavours ranging from the fruity coconut or mango brews to rich, dark ales and stouts. Wine lovers shouldn’t shy away from this treasure trove, for The Vaults stock that too. For afternoon tea or coffee with a difference it is hard to top the global variety found in Tea Inc. Tucked away in The Ginnel alleyway, it makes for a great little retreat if you fancy a unique tea and perhaps a bite to eat. The tea selection covers literally every single taste or mood, with captions underneath each option to pair it with your mood. 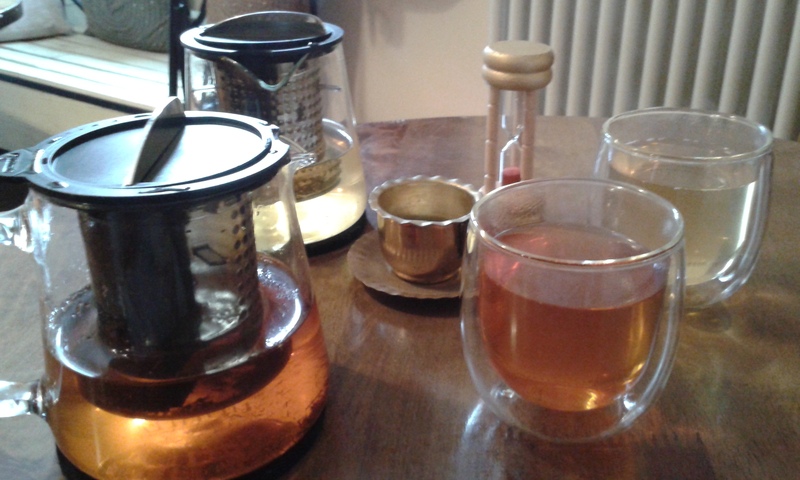 We went for a pot of coconut, orange and raspberry enthused rooibos as well as a jasmine and rose white tea. Both blends were expertly balanced with all the flavours coming through perfectly and leaving a brilliant after-taste. The rooibos was a perfect refresher while the white tea left a delicate, clean feeling. Even for those who aren’t won over by tea, there are options available with Tea Inc’s list of gourmet coffees. A variety of tea blends at Tea Inc.
To complete the holy trinity that is the title of this post we have The Black Swan, which recently underwent a major interior design renovation. The result of this is a décor scheme that is bursting with quirks, antiques and curiosities of British history. Features such as music posters, clocks, vintage furniture, candles and open fireplaces make for a pub that is incredibly cosy while being full of things to look at. The collection of objects felt like a brilliantly bonkers museum collection but at the same time, the pub is a great place to laze away a winter afternoon. The Curiosities Market taking place not far from here had really fuelled my appetite for quirky treasures, and The Black Swan show what a great effect they can have on a place. Each one of these places is interesting enough to have a post of its own, but this week I wanted to bring you a selection of hidden gems. 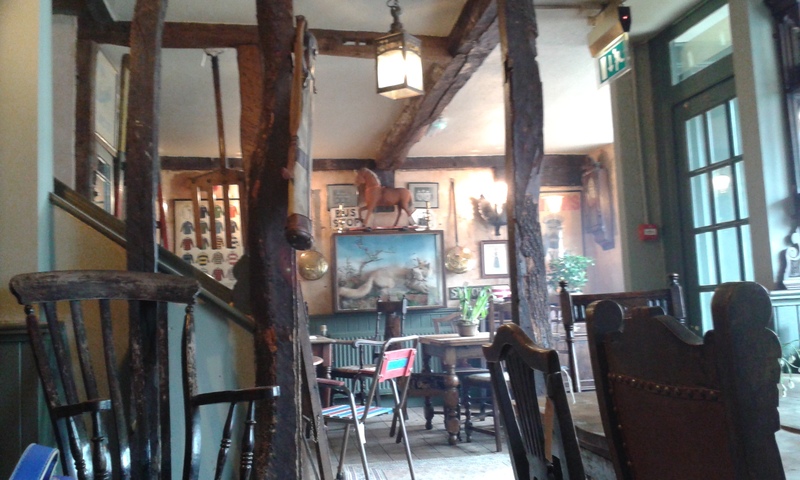 I am excited to try more of the beers at The Vaults, to enjoy more of the tea blends at Tea Inc. and to continue taking in the fantastic décor at The Black Swan. I say it often, but it is places like this that show just how many gems are out there, being enjoyed by many and waiting for new people to discover them.